Deciding to go backpacking is a brave thing to do. A lot of people fear being without and not having any real plan or destination. It’s the freest thing anyone could do and a lot of people old and young are taking the leap of faith into backpacking. This style of traveling can be used for going across Europe, Africa, Asia or any other part of the world. It’s important to carefully plan your trip, so you don’t end up stranded while you’re traveling around. The following tips can be used to help keep your backpacking journey safe and fun. You don’t want to go anywhere without it. You never know when there will be an emergency requiring you to contact local authorities. It would also be a good idea to keep in touch with your family and friends back home, so they aren’t worried about you. There will be places where your smartphone won’t work, so you’ll need to find a hotel or cafe with Wi-Fi to make calls. You can use a phone from cheap plans like Straight Talk. If you need ways to make money while you’re backpacking across Europe, you can always use the web to find work. Depending on your skills, you can take up gigs for writing, editing, photography, web design, consulting, research and so on. You can even learn new skills if you’re a quick learner and then put them to use. You can find gigs to do for quick cash on sites like Craigslist, Freelancer and Upwork. Your laptop can also be a great source of entertainment, for watching movies and shows on Netflix, Hulu and other streaming services. Since you’re only toting around a backpack, you need to be smart and selective about the items you bring with you. It’s a good idea to have outfits that are suitable for different weather types. This includes rain, heat and cold. Make sure you have layers you can put on to fight off cold days and evenings. If you’re planning to camp out many nights, make sure you have a quality tint and sleeping bag to keep you warm. It wouldn’t hurt to also have an umbrella you can bring along. It wouldn’t hurt to have a GPS you can use to keep track of where you’re going and where you’ve been. If you have a mission to travel to a specific place by a certain time, then your GPS will ensure you get there. It will also come in handy if you make a wrong turn and get lost somewhere. Your GPS will also be able to help you pinpoint hotels, restaurants and other places you may need to go to along your journey. 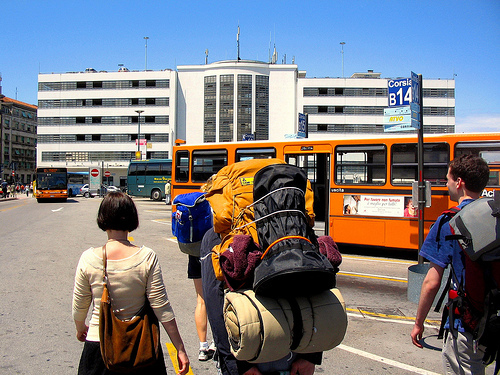 Backpacking is serious – if you’re not careful, you could end up mugged, freezing to death or starving. This is definitely not for the faint of heart and will definitely require some creativity to keep going forward.